This field trial assessed the effects on strawberry yields of replacing field fumigation with periodic applications of Huma Gro® Promax® and Zap® and replacing a grower’s standard fertilizer program with irrigation-applied Ultra-Precision™ blended liquid Huma Gro® crop nutrition products. This trial and others demonstrate that the use of Huma Gro® Promax® and Zap® can achieve high yields on Portola strawberries in California, even without traditional fumigation. 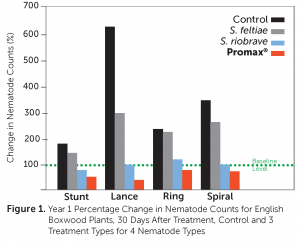 Treatments with Promax® and Zap®, which were applied via irrigation, have the advantage over traditional fumigation in that they are nontoxic, have no reentry interval, and could be applied at any time during the growing season. This is a tremendous advantage over traditional fumigation. This trial also demonstrates that the Huma Gro® Ultra-Precision™ blend of liquid fertilizers applied through irrigation resulted in yields superior to the grower’s standard fertilizer program. 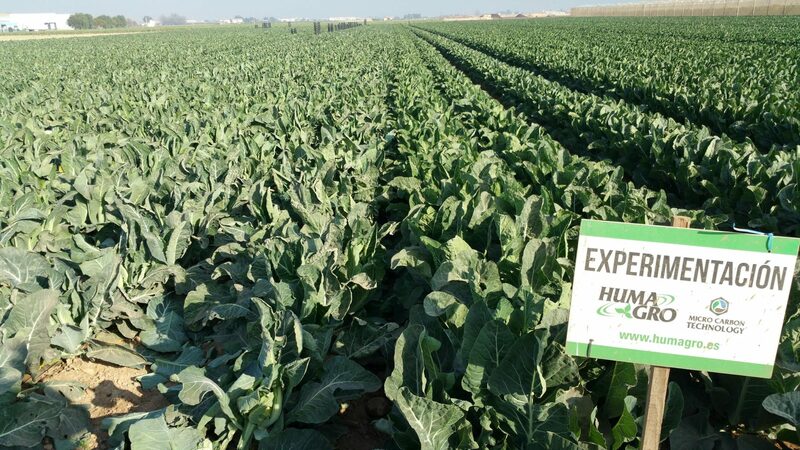 The combination of Huma Gro® Ultra-Precision™ blend of liquid fertilizers plus the Huma Gro® fumigation replacement products of Promax® and Zap® (Treatment 1) increased yields by 97% over the control (Treatment 3). 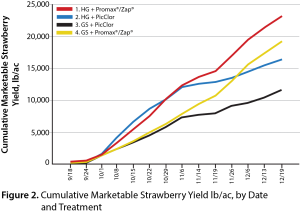 Figure 2 and Table 1 demonstrate that for the two trials that used PicClor preplant field fumigation (Trial 2 and Trial 3), weekly yields began dropping off at week 11/6, while the trials that replaced preplant field fumigation with periodic applications of Promax® and Zap® (Trial 1 and Trial 4) continued to produce at relatively high levels until the end of the season. 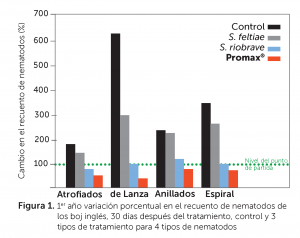 Este ensayo de campo evaluó los efectos de PROMAX® y ZAP® además de la fumigación (más otras aplicaciones foliares de 4 productos fertilizantes Huma Gro®) sobre la producción de fresas Portola, en comparación con el programa de nutrición de cultivos estándar de la productora. Según los datos recopilados en este ensayo, los dos programas de tratamiento con productos Huma Gro® dieron como resultado mayores producciones y un mayor porcentaje de producción comercializable. El Tratamiento 3 dio como resultado un aumento total de la producción del 14 % por sobre el estándar de la productora. Este aumento de la producción correspondiente al Tratamiento 3 dio como resultado un aumento en las ganancias del campo de casi $3.500 más por acre, un aumento del 15 % en dólares de ganancias para el campo (ver Figura 3). 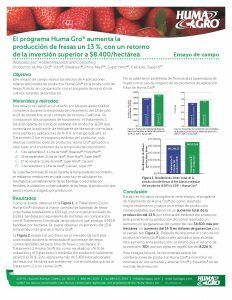 Restando el costo de los productos Huma Gro® adicionales aplicados para alcanzar este aumento en la producción, se estimó que el retorno de la inversión (ROI, por sus siglas en inglés) fue superior a $2.500/acre (289 %). This field trial assessed the effects of PROMAX® and ZAP® on top of fumigation—plus additional foliar applications of 4 Huma Gro® fertilizer products—on the yield of Portola strawberries when compared with the grower’s standard crop nutrition program. 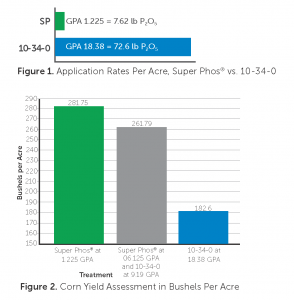 Based on the data collected in this trial, the 2 Huma Gro® treatment programs resulted in both higher yields and a higher percentage of marketable yield. Treatment 3 resulted in an overall yield increase of 14% over the Grower Standard. 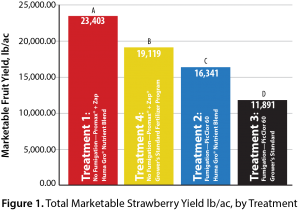 This yield increase for Treatment 3 resulted in a return-to-the-farm increase of almost $3,500 more per acre, a 15% increase in dollars back to the farm (see Figure 3). 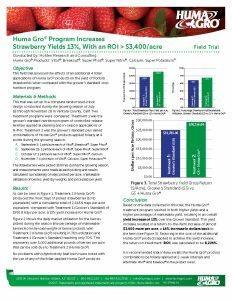 Factoring in the cost of the additional Huma Gro® products applied to achieve this yield increase, the return on investment (ROI) was calculated to be over $2,500/acre (289%). Basado en los datos recogidos en este ensayo, el programa de tratamiento de Huma Gro® dio como resultado mayor rendimiento y mayor porcentaje de producción comercializable, que derivó en un aumento total de la producción del 13 % por encima del estándar del productor. Este aumento en la producción dio como resultado un aumento en las ganancias del campo de casi $8.600 más por hectárea, un aumento del 14 % en dólares de ganancias para el campo (ver Figura 3). Después de descontar el costo de los productos Huma Gro® adicionales aplicados para alcanzar este aumento en la producción, se estimó que el retorno de la inversión (ROI, por sus siglas en inglés) fue del 8.226 %. Para ensayos futuros, se recomienda aplicar las combinaciones de productos Huma Gro® a nivel foliar en intervalos de dos semanas y alternar Vitol® y Breakout® en las mezclas de productos. The cauliflower on the left was planted 3 weeks earlier than the cauliflower on the right, meaning the control is an older crop—although it looks worse for wear and is shorter. 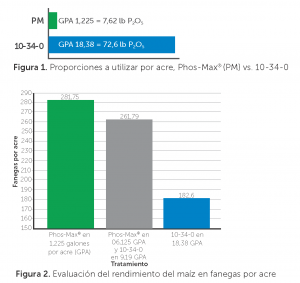 The two groups have equal nutrition programs: the difference is time and ZAP® at 5L/ha. Because of the improvement in soil structure and the flourishing of microorganisms, there is more water available to the plant—resulting in a more vibrant color (an indicator that the plants are receiving more nutrients) and stronger vigor and turgidity (meaning the leaves are very firm and have absorbed more water than the control because there is more soil-available moisture). Along these same lines is that by having more water in the leaves, they are less susceptible to low-temperature stress and the plant physiology will continue to function at lower temperatures without losing pace, improving productivity.